Our pastor had started Bible studies with Julie but he was moving to a new church. I was given the privilege of continuing her Bible studies. Opening God's word and leading Julie into a study of the scriptures was one of the most rewarding things I have done. Although her background and upbringing were rough, Julie had an open heart and was keen to learn. However, she did not accept anything we studied unless she understood it properly. She would say, "No, that doesn't make sense. Could you go through that again?" She challenged me and kept me on my toes but when she understood what God taught through His word, she accepted it enthusiastically. Her thirst and openness were a delight to witness. But there was one study looming that had me worried--the subject of tithing. Julie worked part-time in a local cafe and, with two daughters to support and no maintenance coming in, she did not have a lot of money. 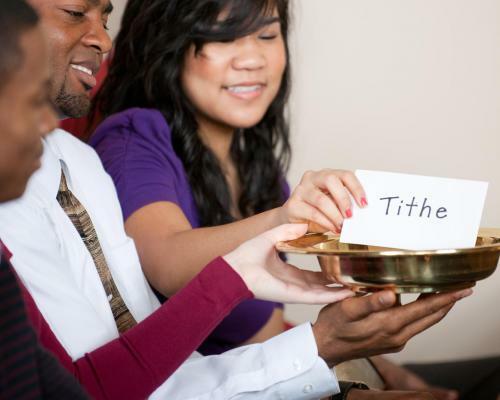 Nevertheless, the time arrived and I went through the Bible study on tithing. Then I explained how our church uses and distributes tithe for its work, locally and worldwide. Julie asked questions, as was her custom, and at the end of the study she nodded thoughtfully and said, "That makes a lot of sense to me." The following weekend she was not at church, so after Sabbath school I drove the few blocks to her home to see if she was all right. She met me at the door, explaining that two of them had head colds and they had opted to stay home. Then she said, "But I am glad you called, Marg. Could you do something for me?" She disappeared, only to emerge a moment later with an envelope and asked if I could take her tithe to church for her. A little while later, I met our former pastor, who asked after Julie. I told him she was still growing in faith and that she was an encouragement and inspiration to me. I related to him how she had recently had a major problem at work and how God had helped her through it. Julie worked at a restaurant in the kitchen. She helped prepare meals and washed up but refused to work out front. She had explained to me that some patrons could be rude and she did not want to deal with them. This caused some problems at times, especially when they were busy. During one particularly busy shift, her manager again asked Julie to help relieve the pressure by working out front. Julie refused and her boss said, "If you are not prepared to help when we are really busy, I would be better off employing someone else." "When I started this job it was on the understanding that I would not be called on to serve the public," Julie replied quietly. "I am sticking to that. If you have to put me off I understand but I am not going to change." She went home that night and, as she prayed about the situation, she remembered Jesus had promised to be with her always and that He was her friend. She talked to Him of her fears, and came to the realisation that by being ruled by fear she was not giving God the chance to guide and rule in her life. She contacted her boss and said she was willing to work in both capacities. As I was retelling this story to our pastor, I realised Julie was now getting a lot more work and was better off financially as a result. When I got home, I asked Julie for permission to ask a personal question. When she agreed, I asked, "Since you started paying tithe, do you have more or less money to live on?" She opened her mouth to say less, when a look of surprise and wonder crossed her face. Then, with a beautiful smile, she said softly and reverently, "I have more." Such love has no fear because perfect love expels all fear. 1 John 4:18. Margaret Bernoth lives in Warwick, Queensland.